Earlier this week Moon's foreign minister Kang Kyung-wha told parliament that Seoul was reviewing its own sanctions against the North. SEOL: South Korean President Moon Jae-in called Friday on the United States to move towards the nuclear-armed North's demands for a declaration the Korean War is over, as the allies pursue increasingly different approaches towards Pyongyang. For its part Pyongyang - which long insisted it needed nuclear weapons to defend itself against a possible US invasion - has pledged only to work towards denuclearisation "of the Korean peninsula", demanding simultaneous moves by Washington in return, with a peace declaration its first priority. "The North has stopped all nuclear and missile tests, dismantled its only nuclear test site and is now dismantling its missile engine test facilities, and is promising to take steps toward dismantling its Yongbyon nuclear complex if the US takes corresponding measures," Moon told the BBC. "Moving towards such a process is the corresponding measure the US should take," he added, according to a transcript released by the presidential Blue House. The comments, made ahead of Moon's departure Saturday for a tour of European capitals, emphasise the increasing differences between Seoul and Washington, which has 28,500 troops stationed in the South to defend it from its neighbour. But Moon said Kim understood denuclearisation meant more than closing testing facilities. It also included "dismantling facilities that produce nuclear weapons and develop missiles", he said, "and it includes everything else, such as getting rid of existing nuclear weapons and nuclear materials". Pyongyang has made no such declaration in public, and missiles were included in the designs of propaganda posters on display in the capital last month, when it celebrated the 70th anniversary of the foundation of the Democratic People's Republic of Korea, as the country is officially known. The dovish Moon has long favoured engagement with the North, which is subject to multiple UN Security Council sanctions over its nuclear and ballistic missile programmes, and visited Pyongyang last month for his third meeting with leader Kim Jong Un. She later backtracked, saying she had misspoken, and her ministry said no active review was in place. In response to Kang's remarks, Trump said: "They won't do it without our approval. They do nothing without our approval.
" The United States, which spearheaded global efforts to squeeze the North Korean economy last year, has been adamant that the sanctions remain in place until Pyongyang's "final, fully verified denuclearisation". But after a visit by Secretary of State Mike Pompeo to Pyongyang, Trump said this week that a second summit between him and North Korean leader Kim Jong Un could happen after the US midterm elections in early November. Moon expected Kim and Trump to make "bold agreements" in the upcoming summit, he told the BBC, adding he remained "very optimistic" about their talks. 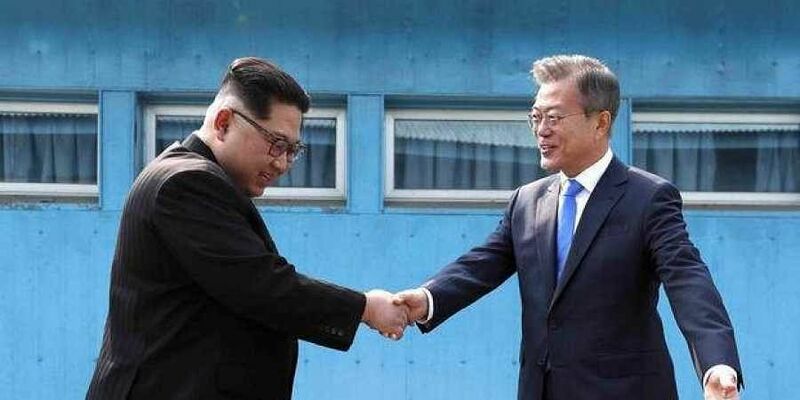 Seoul said separately that the two Koreas will hold high-level talks at the border on Monday to discuss how to implement the agreements made at last month's Pyongyang summit, when Moon and Kim vowed to meet again in Seoul "at an early date". The South's unification minister Cho Myung-gyon will led Seoul's delegation to the meeting in the border truce village of Panmunjom, his ministry said in a statement. It was not yet clear which North Korean officials would take part.